On September 7th, Fort Zumwalt North High School will be hosting Missouri's first ever twilight meet at Pheasant Run Golf Course in O'Fallon. Twilight meets have been growing in popularity over recent years with events such as the Brooks Memphis Twilight and the Nike Twilight in Terre Haute, IN. The Fort Zumwalt North Cross Country Invitational will finally bring this unique opportunity to Missouri, and allow runners to escape the blazing early season heat. The event will be the first Cross Country Meet held at Pheasant Run Golf Course, but as someone very familiar with the course I can say it looks to have the potential to be a very fast and competitive course. You can look at the layout below. Coaches that are interested in competing a can find the meet description and information below. 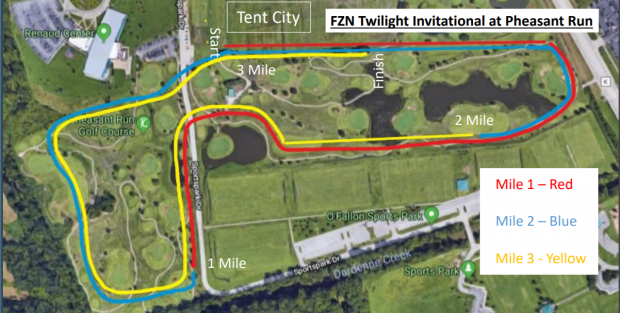 Event Description: Fort Zumwalt North will host a twilight cross country race at the beautiful Pheasant Run Golf Course in O'Fallon, Missouri. The race will be held at night under the lights of the course. The race will provide teams a competitive, fun experience with music and cooler temperatures for an early season meet. It will be a unique experience for your team as it is the only night race in the Saint Louis area.